Okay so we have good news and we have bad news. The good news is that it’s snowing, and the bad news is that you slept in and are about to be late for work unless you get going right now. Unfortunately, the roads have already started icing over, and you’re reasonably sure that they’re going to be completely iced over by the time you get ready to head out. And even if they weren’t, your work involves you driving on snowy ground, which introduces a whole new set of problems. Since we’re going to guess that this wouldn’t be as bad as it seems if you had snow tires, we’re going to recommend an alternative solution to your problem: Snow Chains. 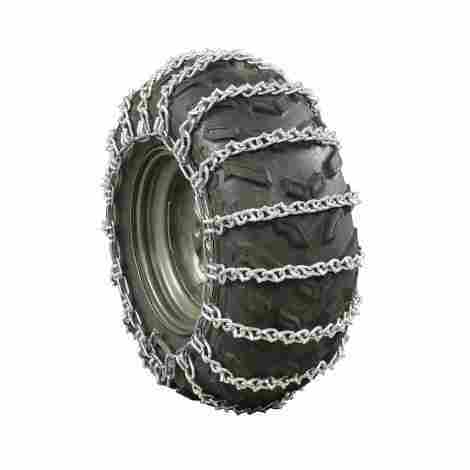 Kicking off this list, we have the Security Chain Company Super Z Traction Chain. This is a snow chain brand that you should get used to seeing a lot of when you look for snow chains out there. When it comes to high quality snow chains, they may not objectively be the best, but they’re definitely the most consistent with the quality of their work. And the Super Z Traction Chain exemplifies that excellently. One common complaint people tend to have with snow chains is the fact that some leave you needing to re-tighten the chain after every couple of miles or so. A problem that you’ll find thankfully absent with this chain, which comes with a built in rubber tensioner. This tensioner keeps the chain at an acceptable level of tightness, just enough to keep things together without squeezing your tire too much. Specifically, electronically monitored control systems. This includes anti-lock brakes, all-wheel drive, traction controls, and much more than that. 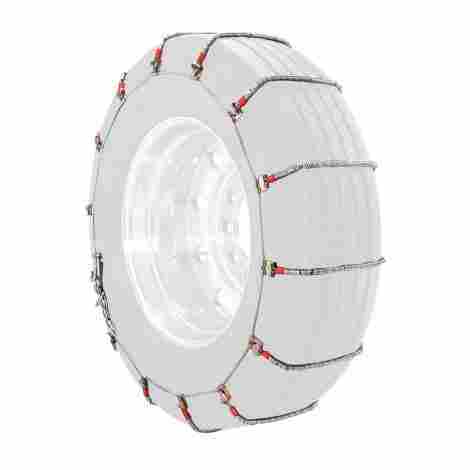 It’s important, as these automatic systems become more commonplace in commercial vehicles, that manual products like snow chains be able to keep up with them. Snow chains, particular those of this high caliber, will cost you quite a bit. However, with this one at least, you shouldn’t be paying all that much, especially not when compared to the pricier items we will see throughout this list. Continuing our praise of Security Chain Company with our second place entry, we have the Super Z6 Cable Chain. 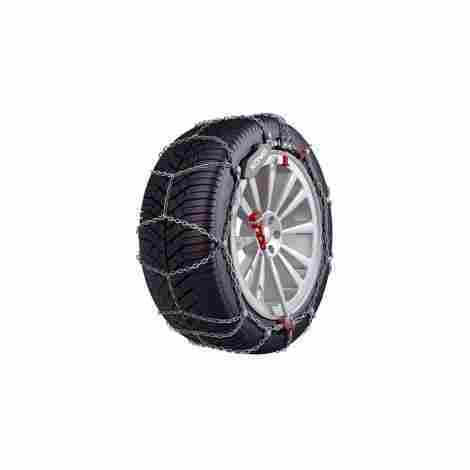 Though only really approved for pickup trucks and SUV’s, and only given very limited operating clearance for drive area tires, this snow chain will still give you the high quality service you need from it. You’ll have absolutely no trouble installing this snow chain, as opposed to other snow chains out there which can feel like “tying your shoelaces: advanced edition.” You won’t even have to move the car anywhere in order to attach the chain, simply follow the easy to read instructions, and you should have them on in a minute or two if even that. The main thing that anyone looks for in a snow chain is traction. Snow is incredibly hard to move anything with four wheels on, and snow chains are meant to help with that by giving your tires that extra grip. Which is why Security Chain Company’s snow chains go so far out of their way to make sure every one of their snow chains gives you excellent traction on snow and ice. It is with this entry that we start seeing more of the average baseline for the prices of these snow chains. While not the priciest thing in the world, it will give you pause regardless. However, the fact that this item comes in a pair should sweeten the pot somewhat. Finishing up our top 3 segment, we have the Security Chain Company Radial Chain. This snow chain is more of a basic model, bringing with it the same baseline quality expected of Security Chain, while also being just inexpensively made enough to have a much more tempting price tag. Of course, that isn’t all that this chain has to offer. 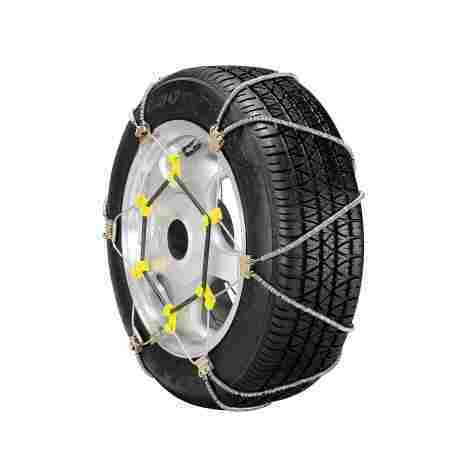 You may be a bit hesitant to use snow chains, because you may be worried about what the added weight of strapping metal chains to your tires might end up doing. However, you need not worry when it comes to the radial chains, because though they have the same amount of strength and provide around the same traction as the previous entries, this chain is much lighter in weight. It’s one thing to provide excellent traction and control when going in a straight line, but turns are a different manner. This is the true test of the merit of a snow chain’s abilities, and a lot of potential entries flopped in this area. Which was not a problem with this one, as this chain provides an excellent amount of control when making those otherwise risky turns and corners. While we said the previous entry was going to be the average baseline for the price of a snow chain, this one is the immediate exception to that. This snow chain is far more reasonably priced than its predecessors, so if you need a good snow chain at a decent price, this is the one for you. 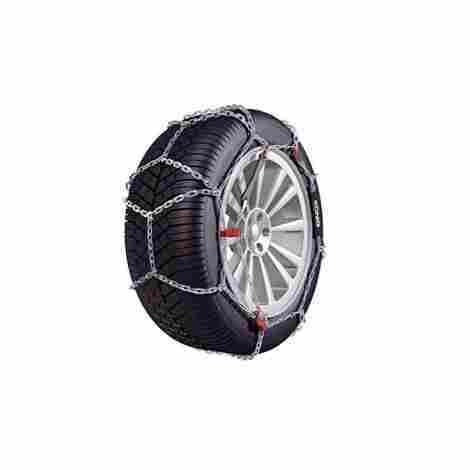 Coming in at #4, we have the Konig Thule Snow Chain. Konig isn’t quite as renown as Security Chain Company, but as you’ll see throughout this list, they definitely have more than a few wins to their name. With that said, let’s see what the Thule has to offer. Driving on ice is just about the most dangerous thing you can drive on, even if it’s a tiny sheet of ice on an otherwise normal road. Unless you have specially made tires, your car is going to skid like crazy when driving on an iced over road. Which is what makes these chains so impressive, as they not only glide through the snow with ease, they make quick work of any kind of ice they roll over. You’ll barely even notice you’re driving on ice, to begin with. But there’s one other problem with using snow chains: the fact that they’re metal an in freezing cold temperatures. Frozen metal is brittle metal, especially when it’s a series of super thin chains like snow chains often are. However, through clever design and a few coatings of special materials, you’ll never find these chains freezing over. And like that, we’re back to business as usual with the prices of these snow chains. While not quite as expensive as the second place entry, it’s far pricier than the previous entry before this one. However, like with all the snow chains that cost this much, you get what you pay for. But we couldn’t stay away forever, could we? Yes, for our #5 entry, we’re back with Security Chain Company with their Peerless Auto-Trac Chain. Many consider this model to be their best work yet, and as we will soon learn, for very good reasons. So, let’s not waste any more time and get right to it. Like we said in the first entry, most snow chains have their own little ideas for solutions for the problem of having to re-tighten the chain every couple of miles when using them over long distances. In this case, that solution is to have self tightening ratchets that require basically zero input from you beyond putting the thing on and taking it off when you’re done with it. Traction is all well and good of course, but if you don’t enjoy the ride while you’re taking it, the novelty of these chains is going to wear off very quickly. Luckily, the design of this chain has that covered, being designed in a diamond pattern. This pattern provides the car with a smooth ride, while also giving the tires superior traction to almost every other entry on this entire list. Once again, we have a very average price for this snow chain. However, this chain comes in a variety of sizes, or “series” as the term goes for car gear. And thus, the price fluctuates depending on what series you get, though not by too much. For our #6 entry, we’re looking at the final Security Chain Company entry on this list, the Security Chain Company Shur Grip Traction Chain. These are, like the 3rd place entry, a much more basic brand of snow chain than the other Security Chain Entries we’ve seen thus far. But luckily, the upside to that is a much more reasonable price. But let’s see what this one has to offer anyway. When it is freezing cold out there, to the point where there’s so much ice on the road so as even to warrant using a snow chain, you obviously don’t want to be kneeling on the ground putting on four snow chains for very long. Which is why this snow chain utilizes special rubber tighteners to make installation several minutes faster than it otherwise would’ve been. You may want traction out of a good snow chain, but another thing that you want from your snow chain is to not rock the proverbial boat too much. After all, it’s much harder to drive when the chain is so noticeable, every rotation per minute feels like you’re running something over. Thankfully that isn’t a problem here, the chain is flat and flexible enough to make sure your ride is as smooth as can be. As we said, the biggest benefit for the barebones approach is that the price is much more reasonable. Not quite as cheap as the #3 spot, but still very easy to deal with if you’re looking for a good snow chain but are on a tight budget. Coming in at #7, we have the Quality Chain Cobra Cable. A cable snow chain is a much more minimalist approach, and while you can’t drive as crazy when using one, you’ll barely even notice it’s there, giving you a completely smooth and easy ride. So what else does this snow chain have to its name? Let’s take a look and see. Unlike the other entries on this list, this is a snow chain that should only be used in emergencies, as its lightweight nature would not survive long periods of use. However, this also makes this snow chain incredibly easy to store in your car just in case you need it. So, if snow has suddenly started piling up, and you’re far away enough from your house that you know the snow will be everywhere before you get there, then this will make for some nice extra insurance. Just be sure to take them off after. Despite their light weight and small size, you’d be amazed at just what this snow chain can put up with without breaking into a million pieces like its less sturdy peers would. This mostly comes from the very strategically sound design of the chain. The best part of this chain is the price. Not to say that it’s lower than the #3 entry, but it’s because it comes in sets of two. So, while the price is a bit higher than the #3 entry, the fact that you can get all four without spending quite as much as you would for the other one is notable. Kicking off our final 3 entries, we have our #8 pick, the Glacier Chains V Bar Twist Link. Quite the mouthful, isn’t it? Well, don’t let the word salad name throw you off, as this is still one of the best snow tires you can reasonably find out there right now. So, what makes it this way? Let’s find out. This is, without a shadow of a doubt, the toughest, most durable chain on this entire list, and easily one of the toughest snow chains out there period. Made from tough carbon steel that can easily take the cold and all that comes with it, this chain will see you through even the nastiest snowstorms without so much as an icicle coming off of it afterward. This chain will take you practically no time at all to mount onto your tire. Mostly thanks to the lever end fastener that this chain is made with, giving you an easy way to tightly mount this chain onto the tire. And once on, it’s almost impossible to take off unless you want it off, thanks to the twist link cross chain and welded v-bar that keeps it all in place. Despite its higher quality than most snow chains on this list, it still stands at a very average price tag, making it a much better deal by that metric. 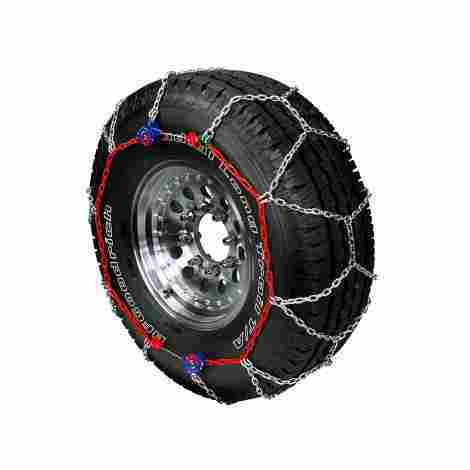 For our second to final entry on this list, we have our second offering from Konig, the Konig CS-10 Snow Chain. While Konig only got two entries for this list, the two showcased here are genuinely some of the best snow chains on the market right now, so that has to count for something. With that said, let’s see what this one has to offer. It’s one thing to have a system for your snow chains that lets them tighten themselves as they need to, removing the need to tighten from your hands. However, what sets this snow chain apart from the rest is the fact that it also comes equipped with an automatic release function for when you need to remove the chain. The problem with mounting a jagged metal chain on a rubber wheel is obvious: there’s the danger of it jangling around until it scratches an actual hole in the tire. Fortunately, that won’t happen with this tire, since it comes with anti-scratch nylon bumpers. These bumpers are placed where the chain is otherwise fairy sharp, keeping a nice barrier between the two at those areas. For what this snow chain is offering you, the price is excellent. Just cheap enough to be affordable, but not so much so that it undersells the product and the features thereof. 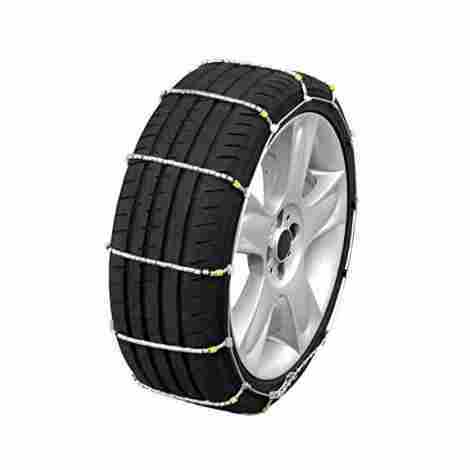 For our final entry, we have easily the most unique entry for this list, the Zip Grip Go Cleated Tire Traction Device. Sometimes you really just need to get going, and thus don’t have time to mouth a chain to each one of your four tires. For those in such desperately speedy scenarios, this is the alternative for you. It should go without saying that this is the easiest item on this entire list to install. They are literally zip ties with cleats attached to them. So, all you need to do in order to mount them to your tires is to simply wrap the thing around the tire and tie it down nice and tight. One thing that people tend to forget about cleats is that when it comes to being attached to objects like tires, those cleats better be pointing in both directions otherwise the traction will be lost when you need to move in the opposite direction. Which is why these Zip Grip cleats come with those cleats being pointed both ways, for maximum coverage. Not being made of metal and all, this is, of course, the cheapest entry on the entire list. So, if you need a quick, backup option for a snow chain in the event of an emergency, this is what you go with. Snow chains are not a surefire replacement for snow tires. Snow tires are generally more reliable, more versatile, and definitely last for much longer. However, you won’t always need snow tires and will have to change them out and put them back in as you need them. Which, as you can probably guess, can take a very long time. This is where snow chains have a leg up on snow tires. Snow chains are something you can put on very quickly when you’re in a hurry to get somewhere, there’s a lot of snow and ice on the road, and you don’t have the time to change out your tires. 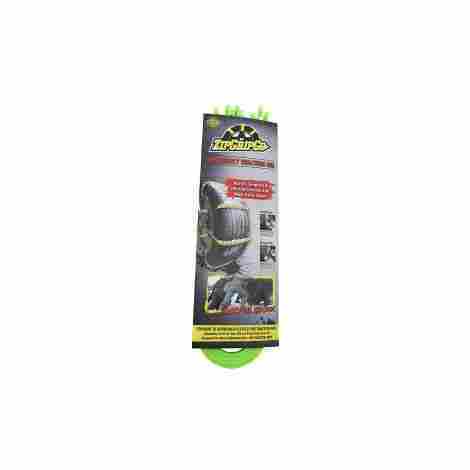 They provide excellent traction, usually last a pretty long time, and have a multitude of other features. When it comes to snow chains, the ten entries we have assembled here are the absolute best that we could find on the market. They provide everything that a snow chain needs to in the best capacity out of all of the other entries we screened. So, if what you need is a snow chain, whether as a backup or as your sole solution to the winter ice, then these ten entries here should serve that purpose well. The moments in which you would need a snow chain are usually when it’s, of course, snowing, and you need to be somewhere. Obviously, you don’t want to be out there in the increasingly cold weather longer than you have to, so installing the snow chains should be a quick, painless task. Installation is typically fairly simple, just roll the car over the laid out chain, then clip the chain onto the wheel at the top point, then tighten her down. However, there is another factor you need to consider that’s connected to this. Here is the bottom line: get a snow chain that tightens itself. It may not seem like such a big deal but having to constantly stop to re-tighten the chain on the tire will get old, and it will get old fast. Thankfully, manufacturers figured this out quite some time ago, and so have figured out a wide array of different solutions. All of them serve the exact same purpose; either keep the chain nice and tight or automatically re-tighten when it starts to loosen, saving you the trouble. This should be considered mandatory for your snow chains since this will save you hours of time spent re-tightening the chains over and over in the long run. The vast majority of snow chains use some kind of metal as the basis of its construction. What type of metal it depends on the brand and specific chain. Be wary though, if you start looking for the highest grade materials. The tougher the material, the higher the cost tends to be, but we’ll get more into that in a bit. The most commonly used metal is hardened steel, though as you’ve seen throughout the list, some entries take it a step further by constructing the chains out of high carbon steel, which is even stronger. But what are we actually here for? Simple, traction. Above all else, a snow chain must provide excellent traction if it is to succeed and even be considered for this list. This all has to do with the grip the cleats attached to the chain has on the snow/ice below. The reason that these snow chains are so much better at gaining traction on ice than normal tires is that of these jagged, cleat-like edges on the bottom. They punch through the snow to get to the ground underneath or just grab onto the ice to help the tire move more firmly across. It’s important that these chains have two-way cleats, so you can have just as much traction when going in reverse. Of course, when you have chains made of metal, you have a certain expectation in terms of how much punishment the chain in question can handle. The durability of the chain usually comes down to the design of the chain once mounted, since the materials used to make it are very rarely the problem. How the chain is designed is actually a very vital part of the entire structure and overall quality of the chain itself, but that’s for later. You can tell the durability of a snow chain usually by how much it rattles around while mounted onto the tire. If you’ve made absolutely sure that the chain has been firmly mounted onto that tire, then it rattling around is a problem. For our final entry, we have the price of the snow chains. This was a somewhat complicated matter to pin down, mostly because the price of each entry often dipped up and down with seemingly no rhyme or reason. After some digging into each entry, we ended up finding those subtle differences between them. There are of course the main differences; the more features a chain has, the better materials are used to make it, and so forth, the higher the price tends to be. However, there is also a multitude of other factors that play into this. For the entries that made it onto this list, we judged how well each entry justified the price they were asking for. Because if you pay $90 for a snow chain that falls apart the minute, it’s out of the box, we think it fair to assume that you would be a tad nettled by that turn of events. Using this method of evaluation, it was relatively easy to assemble the list properly from there. For the final segment of this article, we’re looking at the most frequently asked questions about snow chains that we could find. While we couldn’t find all that many, what we did find was vital enough that we felt it needed to be shared with you. As such, the following are the most vital and most frequently asked questions about snow chains, and the answers thereof. Q: My friend says he once drove over 50 mph while wearing snow chains on his wheels. Is this possible? A: Absolutely not. Your friend is most likely lying, or he doesn’t know what a snow chain actually is. Because if he knew what snow chains were, he would know that the durability of a snow chain tends to be negated completely once your wheels start going too far into the double digits. Generally speaking, unless you find a snow chain made from high carbon steel (which does exist, to be fair) you should stick strictly to about 30 mph at maximum. Q: Why is the design of the chain so important once it’s mounted onto the wheel? A: A few reasons actually. For one, the design of the chain dictates where the cleats are situated across the wheel itself, meaning the design of the chain is an indicator of how often the chain is going to provide you with the traction you need. 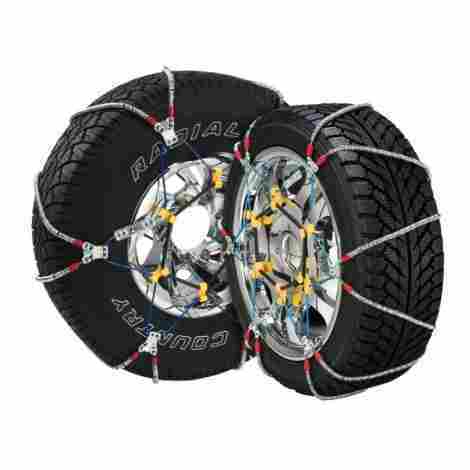 But most important is this, the design of the chain is a vital aspect of the durability of the chain itself, since how much area the chain covers dictates how much grip it has on the tire when the going gets rough. The tricky part with this is that there isn’t one surefire design, it all depends on the kind of tire you have and the amount of snow you’re actually dealing with. Q: Do you have any tips for someone about to move to an area that gets a lot of snow? A: Buy an ice scraper if you haven’t already and keep it in your car door pocket at all times. Trust us, you will need it. Keep your gas tank at least ¾ full as often as you possibly can. Even with snow chains, driving through snow and ice is no easy feat, and it guzzles up a lot of gas if you aren’t careful. Always, and we do mean always, check the levels of oil and coolant in your car, as well as the antifreeze, lights, and tire pressure. Finally, while this article is primarily about snow chains, if you’re moving permanently to an area with lots of snow, buy snow tires. It never hurts to have both of these items on hand just in case. Q: Why do I need snow chains when my car has anti-lock braking and all-wheel drive? A: Anti-lock braking and all-wheel drive are invaluable functions to have in any car, but they are no substitute for a good snow chain or snow tire. We’ve yet to fully integrate a system into a commercial vehicle that can handle the snow and ice without those add-ons. Mostly because there’s no need for tires with cleats the rest of the year. So, it’s just best to play it safe and stick to buying a good snow chain.